In medium bowl, beat cream cheese, sugar and salt with electric mixer on medium speed until smooth, scraping bowl occasionally. Beat in caramel sauce. On low speed, beat in 1 egg until blended. Set aside. Make brownie batter as directed on box for cakelike brownies. Spread in pan. Spoon cheesecake filling by generous tablespoonfuls evenly onto batter. Cut through mixture several times with knife for marbled design. Bake 33 to 37 minutes or until toothpick inserted in centre comes out clean. Immediately sprinkle with Toppings. Cool 30 minutes. Refrigerate uncovered 2 hours. Remove from refrigerator 15 minutes before serving. Cut into 6 rows by 4 rows. Cover and refrigerate remaining brownies. 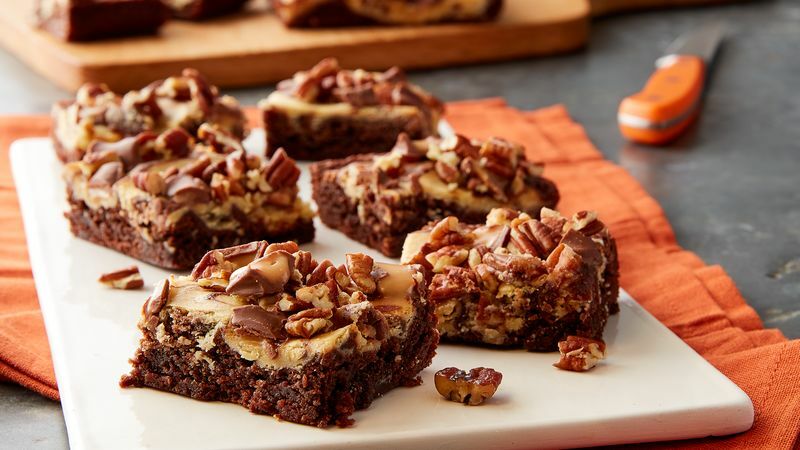 For best results, make sure Rolo™ pieces remain separate when sprinkling on brownie so there is caramel in every piece! To toast pecans, heat oven to 350°F. Spread nuts in ungreased shallow pan. Bake uncovered 6 to 10 minutes, stirring occasionally, until light brown.